A cracked cast aluminum transmission case is repaired with Super Alloy 5 and an oxyacetylene torch. 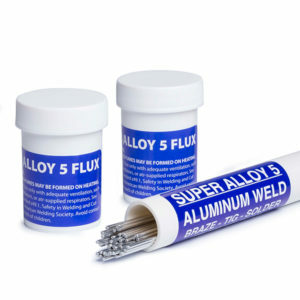 Due to the thickness of the aluminum, we recommend using oxy-acetylene and a size 3 or 4 tip. Once you get the cast to the proper working temperature, the aluminum filler rod flows in wonderfully. Always keep your flux bottle as close as possible to the repair area, because every time you move your torch away, the aluminum drops approximately 100 degrees per second. Always angle torch in the direction of the crack. Thick aluminum requires oxyacetylene, oxypropane, oxynatural gas, or oxyMapp gas to heat the base metal to the required 600 degrees. If your flux is not liquefying, it is because your base metal is not hot enough.